Did you ever fear the school nurse? Her stern demeaner and obsession with cleanliness may have stemmed from the ladies who ran the field hospitals of the first world war. There are few historical women who broke the mold so cleanly as did the nurses of WW1. What better way to siphon some medical inspiration into her life than your girl dressing up as an affectionately nicknamed "gray lady" of WW1? The nurses of World War One were worthy women to aspire to. They showed the world what women were truly made of in an era where woman were seen as fragile. In this WW1 nurse costume your girl can channel the strength and bravery it took to save lives on the Western Front, without handling any of those outdated medical supplies. Your child will have no need to trudge through the mud trenches of France to pretend she is saving the lives and keeping doctors in line. This costume inspires creativity with its clean white headdress and apron emblazoned with the ever memorable insignia of The Red Cross. In her starched veil and apron she will demand respect from imaginary doctors and soldiers alike. 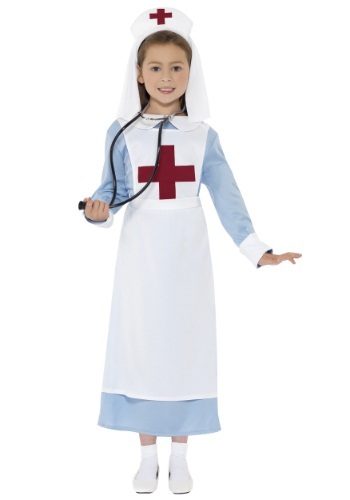 In this costume she will star in the school play with her graceful acts of mercy or demand candy S.T.A.T. while marching in the Halloween battalion. She can offer bandages to the poor ghost who stumbled and scraped a knee. She might offer a cool cloth to her overly indulgent friend, suffering from a sugar coma. Either way this costume will bring out "the angel of mercy" nature in your child. You never know if this new found point of view may seep into her day to day attitude. Just one thing, if she does grow up to be the school nurse, do us a favor. Remind her that laughter, not shots, is the best medicine.